Getting to know your installer and your system is very important. If you have a question that you don't see here, contact us and we will provide you with an answer! + Where can I purchase Replacement parts for my irrigation system? Most products should be installed by professional contractors but to purchase replacement parts, you may contact us on our contact page or call for availablity. + I live in an area where sprinkler systems need to be winterized. What will my contractor do to my system to prepare it for freezing temperatures? Winterizing sprinkler systems in cold climates is a necessity and must be done correctly to be effective. We highly recommend you call us for an inspection of your system before you winterize for several reasons. You want to make sure that it is done right as to not add more unneeded expenses. + What procedures should I follow when starting up my system after the winter months or after a long period of inactivity? The best way to get your system up and running in the spring is to have Cedar Valley Irrigation go through our startup procedure. We will be able to check and make sure all the components are working properly and help to ensure that your system is ready to work for the season. If you decide to attempt to start up the irrigation system yourself, please refer to this checklist for important steps to follow. Before turning on any water to the system, make sure all manual drain valves are returned to the "closed" position. Open the system main water valve slowly to allow pipes to fill with water gradually. If these valves are opened too quickly, sprinkler main lines are subjected to high surge pressures, uncontrolled flow and water hammer. Walk through each station on the controller, checking for proper operation of the zone. Check for proper operating pressure (low pressure indicates a line break or missing sprinkler), proper rotation and adjustment of sprinkler heads, and adequate coverage. Check and clean filters on poorly performing sprinklers. Adjust heads to grade as necessary. Uncover and clean the system rain sensor, if applicable. + Why would my sprinkler system continue running even after the controller is unplugged? It is possible that your valves have been opened manually. You will need to locate your valve box(es) and twist the solenoid(s) on the valves clockwise until snug. The solenoid is located on the top of the valve and looks like a cylinder with two wires coming out of it. It is possible that you have debris in the valve, which is causing them to remain open. To fix this, you’ll need to disassemble the valve, rinse all the parts with clean water and re-assemble the valve. If you cannot locate your valve boxes or fix the valve, we recommended you contact Cedar Valley Irrigation and we have the experience, tools and knowledge to help. 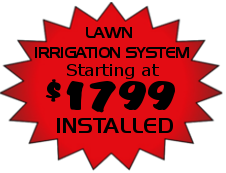 + How often should I check my irrigation system’s performance? It’s a good idea to check it frequently during the peak watering season to make sure that everything is functioning correctly and water is being applied as needed to the plant material. Users will often do a quick run through of each zone after they have finished mowing and trimming. A handy tool to have installed in your system is a remote control. These time-saving devices allow you to walk around your property and turn the valves on and off without having to keep going back to the controller. + How much time do I run my sprinklers to water my lawn effectively?